President Ram Nath Kovind on Monday has gone My Son temple complex in Vietnam which has Indian influence and houses Hindu deities like Krishna, Vishnu, and Shiva. President Kovind, who is here on a three-day visit, also planted a tree sapling in the marketplace to mark his visit. My Son is a cluster of abandoned and partially ruined Hindu temples in Vietnam, built between the 4th and the 14th century AD by the kings of Champa. The complex is located near the village of DuyPhu in Quang Nam Province in Central Vietnam. The complex is located in a valley roughly two kilometers broad that is surrounded by two mountain ranges. “President Kovind visited My Son temple complex in Vietnam, which was the political and cultural capital of Champa Kingdom. The temple complex has Indian influence and houses Hindu deities like Krishna, Vishnu, and Shiva. He planted a tree sapling to mark his visit,” External Affairs Ministry spokesperson Raveesh Kumar tweeted. “Confluence of Civilisations! President Kovind appreciates the artifacts of Cham Museum in Da Nang city Vietnam. Sculptures of Champa Kingdom are displayed there which are highly influenced by Hinduism,” Kumar said. Kovind also enjoyed the local cultural performance at My Son temple complex. 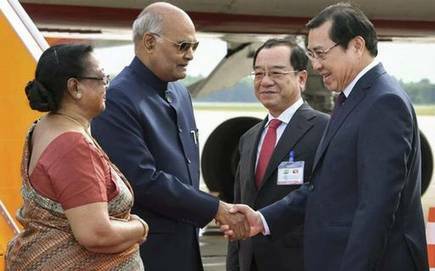 Kovind is in Vietnam as part of his two-nation tour that will also take him to Australia.